On a good road trip, the journey there should be as much fun as the actual destination. In this post are some of the highlights for a trip to Las Coloradas, the salt flats that are near Rio Lagartos and lately famous for their “pink lagoons” which are man made evaporation ponds vital to the production of salt. The area was used by the Mayans back in the day, and in the 1930’s a businessman from Merida bought the land and began what is now one of the country’s major salt producers, with 80% of the salt produced going to the national market. The commercial brand of the salt produced here is Sal Sol and you can find it in any local supermarket. Starting in Merida, you can take one of two routes: the toll or free highway to Valladolid and then up through Tizimin and on to the coast; or, the back road which start by heading towards Motul, home of the famous huevos motuleños, served up by doña Evelia in the municipal market. This should be your route and Motul your first stop, for breakfast of one, two or three (or more!) eggs. 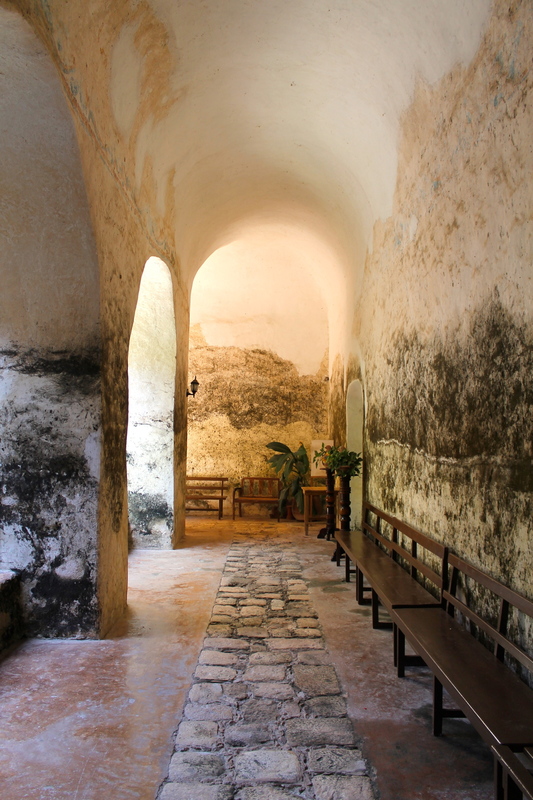 With your breakfast completed and sustenance assured for the trip, have a look at the cenote and church before leaving Motul. Definitely worth a look! The destination on this trip, for Day 1, was Tizimin, where an airbnb rental was waiting for us. Along the way there are plenty of stops to be made here and there and your trip can take anywhere between 2 and 4 hours, depending on how much fun you are having or how many photos you feel inspired to take. In our case, it took most of the day. Notice at kilometer 61, you will feel the need, the urge, to stop and photograph this pink gem. Temax is a good photo stop as well, and Chenché de las Torres is truly out of this world, if you can get in. Finally, we arrived at Tizimin and after some navigational challenges with Google Maps and the recently changed one-way street system, we arrived around 4 PM at our airbnb. In the evening a little dinner, walking and exploring downtown Tizimin on foot and by car - it reminded me of Merida 30 years ago - and then back to rest up for the following day, which was to be all about the salt, the beach and a most amazing Tikin Xic lunch! One of the greatest Mayan ruins sites on the peninsula, Calakmul is also a jungle paradise where you can see many local animals; including - if you are very lucky - the elusive jaguar. If you are looking for a "lost city in the jungle" this is definitely it. The trip I recently did was Merida - Campeche - Champoton (lunch by the sea) - Escarcega - Xpujil where we overnighted in a small but decent enough hotel. 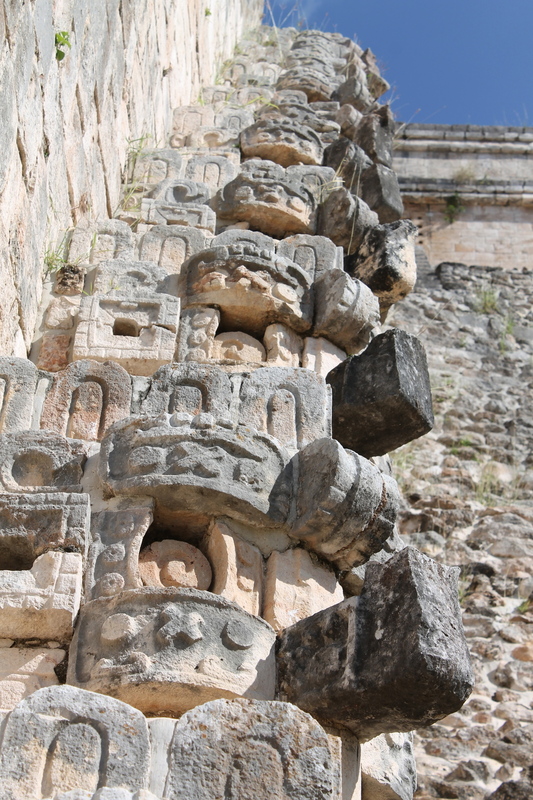 The next day was spent at Calakmul and we returned to Xpujil for the evening. On the third day, onwards to Chetumal where I left my guests to take their flight back to San Miguel de Allende via Mexico City. The drive back from Chetumal to Merida takes about 5 hours if not making any stops. For a future trip I would spend more time in the area, as there are many other ruins sites to visit. Perhaps 5 days total leaving from and returning to Merida, making stops here and there during the driving portions of the trip. 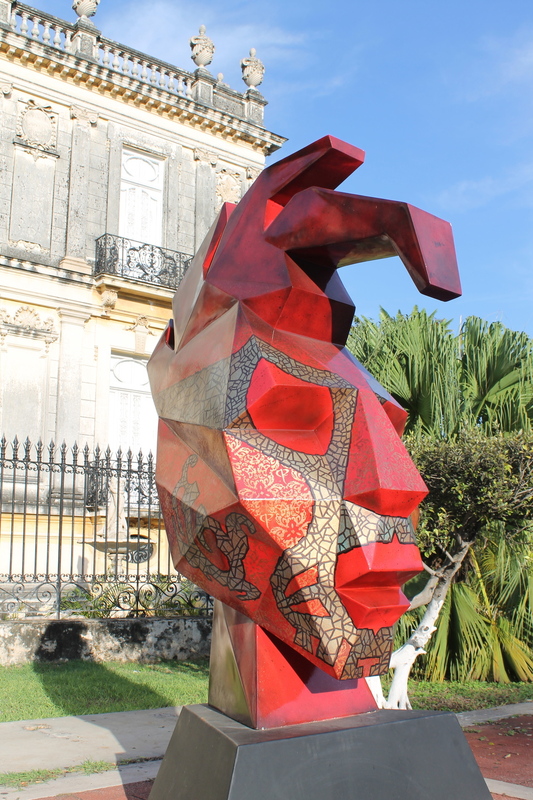 Besides all the usual suspects - ruins, haciendas and cenotes - that visitors to the area love to experience, there is a thriving artistic community in Merida comprised of both locals and newcomers to the area. One very special tour can be arranged to see some of these galleries and meet the artists who create pieces ranging from paint to sculpture and beyond. On this day, which lasted about 12 hours or so, we visited artisans in their homes and galleries, had some great food in spectacular settings and even threw in a home viewing or two. A great day out with two local experts who I shall call Lucinda and Shirley, who are extremely knowledgeable both about art and where to find it in Merida. 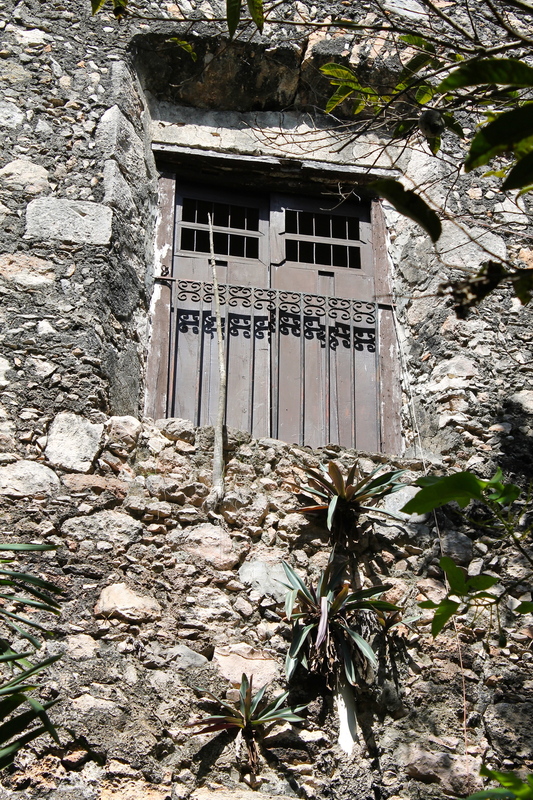 An architectural masterpiece in Merida; yes, it's for sale. The first stop on the tour was a magnificent home, now on the Merida market. A true oasis from the noise and heat outside. The attention to detail and each carefully planned square meter of this home make it really worth a visit. And if you like it enough, you can even buy it and make it your new Merida pied a terre. After the house tour, a look at some galleries! Some of these you would never know about, as they hide behind an unremarkable and unmarked door on a hot Merida side street, while others stand out boldly, welcoming one and all to peruse their interiors. Of course, we had to have lunch at some point. 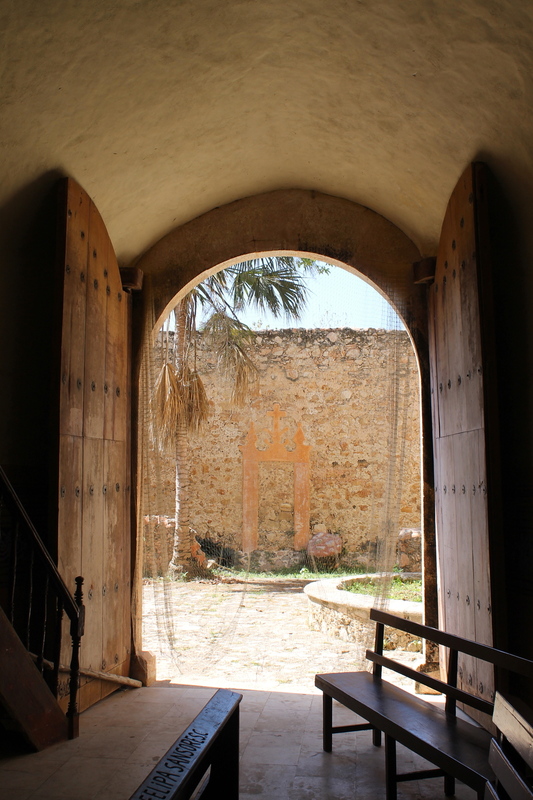 Here, the Hacienda Santa Cruz on the outskirts of Merida. Great food, fabulous place. 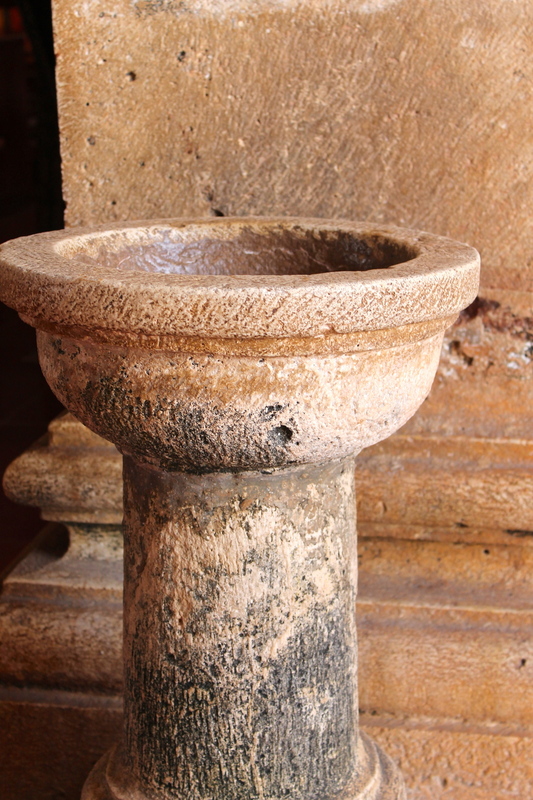 There are some die-hard Maya-philes that want to see all the sites on the so-called Puuc route or Ruta Puuc en español and these generally comprise Kabah, Sayil, Xlapak and Labna, in that order as you are heading out from Uxmal. There is also Sabacche, which has ruins and a small regional animal preserve, including an ocelot what is friendly and will let you join it in its cage (enter at your own risk) and a really interesting feature that showcases the air currents blowing around in the caves beneath your feet. Opening times there are sporadic so it's not always a sure thing. If you are really determined, you can also visit the LolTun caves, which kind of make up the end of the route and take you into citrus growing country. Very scenic and photogenic around there, with lots of fruit trees from mangos to oranges to limes and bananas, due to the excellent kankab or red soil. A day out here, including Uxmal and LolTun, can easily be a 10 to 12 hour day, depending on how interested you are and how much time is spent at each site. Here are a few shots of the ruins of Kabah, Sayil, Xlapak and Labna, in that order. Near Sotuta and Cantamayec, in the heart of the Mayan hinterland, are many hidden cenotes. Normally I would not be writing about hotels and such but this little 7 month old gem deserves a recommendation. La Semilla is an oasis among the hustle and bustle (especially the hustle) of Playa del Carmen. A couple of blocks from the ocean, under a tree with a backyard that reminds me of a typical Yucatecan home "patio" and an interior courtyard complete with fully grown trees, a waterfall and a creek throughout and even a home for the resident "alux". Extremely friendly and professional service, all kinds of commodities included at no extra charge, like the excellent WiFi, bicycles, towels for the beach, parking at the front door (ltierally), breakfast with real, strong coffee and amazing all-natural "jugo de la casa". If you are going to the beach, they will loan you a cooler so you can keep your beers cool. Amazing. It's a respite from what's going on outside and your senses are pampered with lemony scents in hallways and rooms, crispy cool air conditioning in the rooms and relaxing music throughout. Soft lighting at night and plenty of shade during the day. Alexis and Angie have created a paradise and on your next trip to Playa del Carmen, definitely spend a night or three here! The day started with a stop at Uman, which is nowhere near the so-called convent route, but since we were going to Ticul and Mani and had been the other way before, I thought the Uman-Muna route would provide some interesting views along the way. The large small town, our first stop, is where there is a giant church as well as all those insect-like mototaxis buzzing about. Done with Uman and ready for more driving, we continued on to Muna. No church pictures there, but a huge procession/demonstration to do with Earth Day perhaps judging from the signs blocked traffic in Muna's main square while every citizen from the surrounding 17 mile radius marched in the parade. Mostly kids of school age, and in uniform. There wasn't much to do in the traffic, limited though it was and while waiting I snapped a shot of this beautiful old home, probably once owned by some rich fat cat and now a school. Finally, we made it to Ticul. There, after checking to see which was the best way to Mani we snapped a few shots of that church (and the surrounding street area) as well. 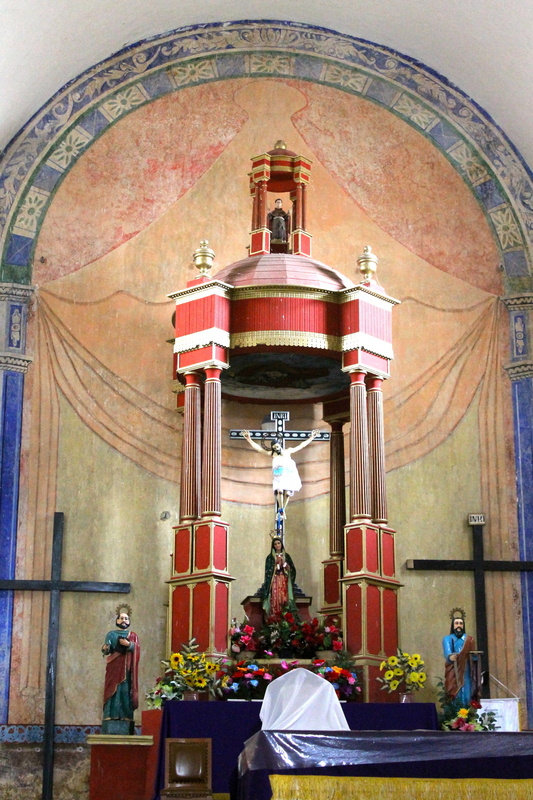 And then, at long last, we made it to Maní, site of the infamous auto da fé, where the charming Friar Diego de Landa, burned as much of an entire culture as one man with a mission can, effectively wiping out the great majority of the Mayans legends, stories and cultural and religious icons. Later, and in his defense when put on trial for overstepping his mandate, he wrote a book about what he had seen and how the Mayans had lived which is now the only record historians have of that time. And to put the proverbial cherry on the sundae, he was absolved of any wrongdoing by the courts in Spain and sent back to the Yucatan and was named "Protector of the Indians". Nice job, Diego. 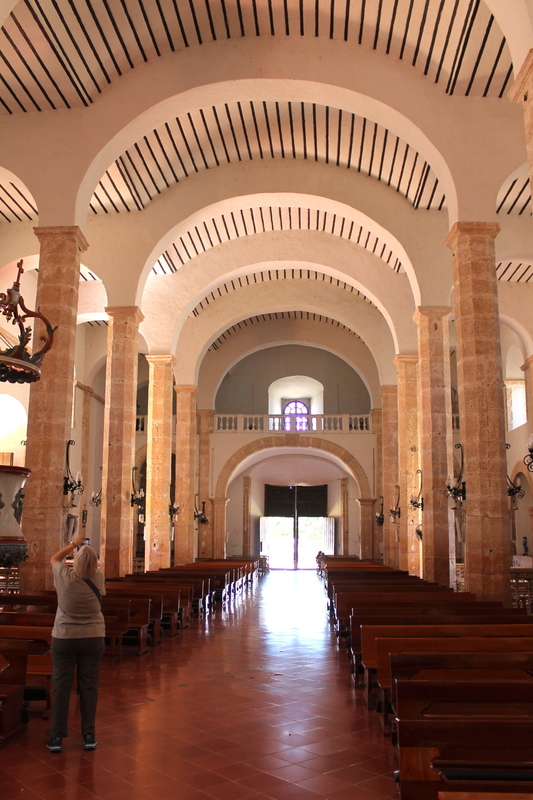 After Maní, what else is there in the world of churches, right? Well, how about the church at Oxcutzcab? This town is famous for it's fruit market and the mural over it, but the church also has it's particular charm. 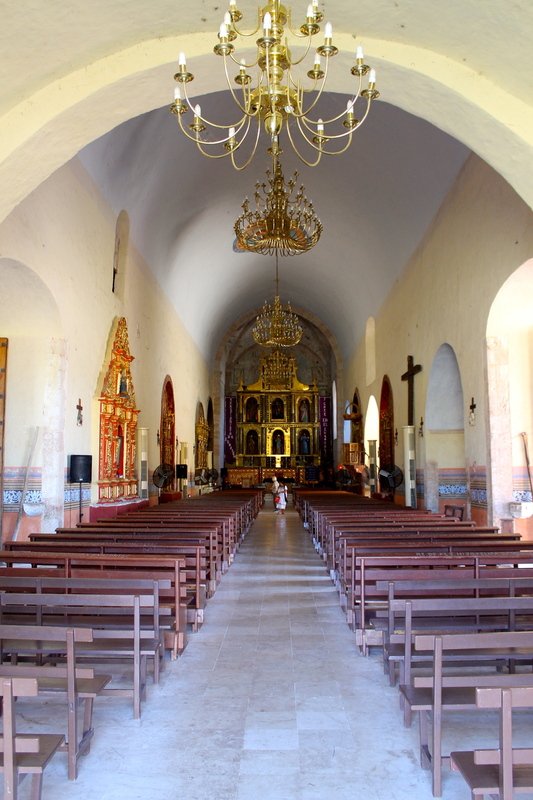 One of the routes that is promoted among tourism organizations is the so-called Convent Route or Ruta de los Conventos. 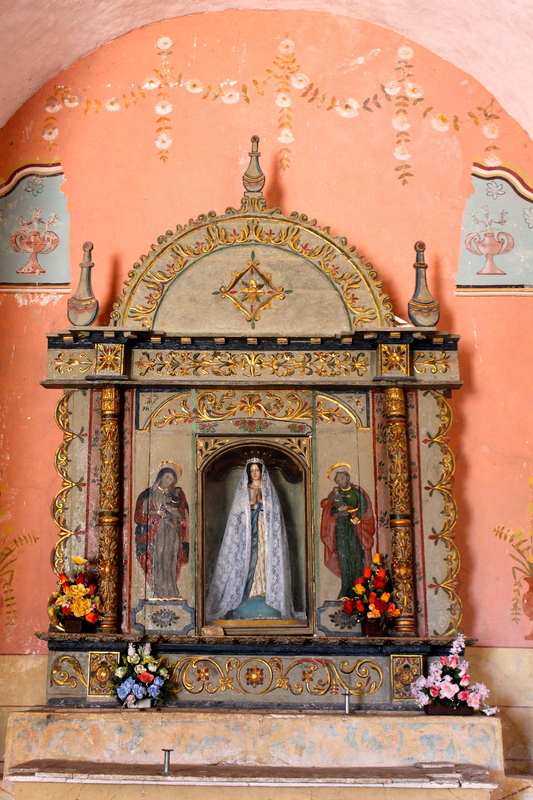 I refer to it as "so-called" as it is really just a list of towns that have churches in them, dating back to the 1600's and that are full of history, but there is no real coordination of the touristic kind and if you arrive after the last morning mass, you are out of luck. No convent for you! So, to do it right, you have to get up early. 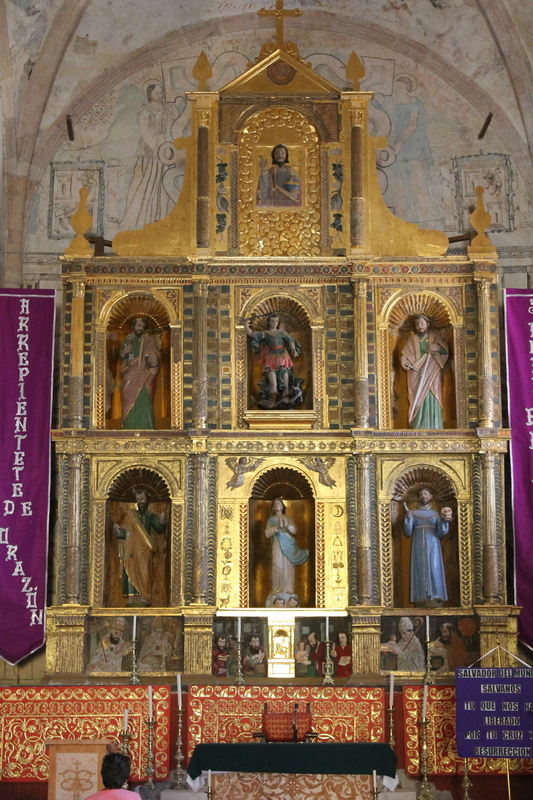 Our intrepid little group of three left Merida at the ungodly (no pun intended) hour of 7 AM and found that that is the perfect time to visit at least 4-5 of the churches on the route before they close for the day. First stop? The furthest point of the day's travel: Teabo. Teabo sounds like what you say when you love someone, in Spanish, and have a cold. Te amo. Teabo. Get it? The photos will speak for themselves; a very picturesque little church that was closed but a little chat with the gardeners trimming the grass outside and they found someone with a key and it was opened just for us. After we had our fill of Teabo and purchased some fresh tortillas at the tortilleria for breakfast, we moved along to our next stop, Chumayel, famous for its black Christ figure which was saved by a local villager named Severo who hid the wooden statue in his home when Salvador Alvarado's troops came to town with orders to burn the insides of the church. Salvador Alvarado was determined to break the church which had far too much power for the politicians of the day and ransacking and burning churches seemed like a good way to go about it. Next stop: Mama. That's "no, no" in Mayan unless someone tells you otherwise. Then, you let ME know what it means. Mama in Spanish of course means female breast (where do you think mammary comes from) and if you add an accent ie. Mamá, then you have Mom. But I digress. 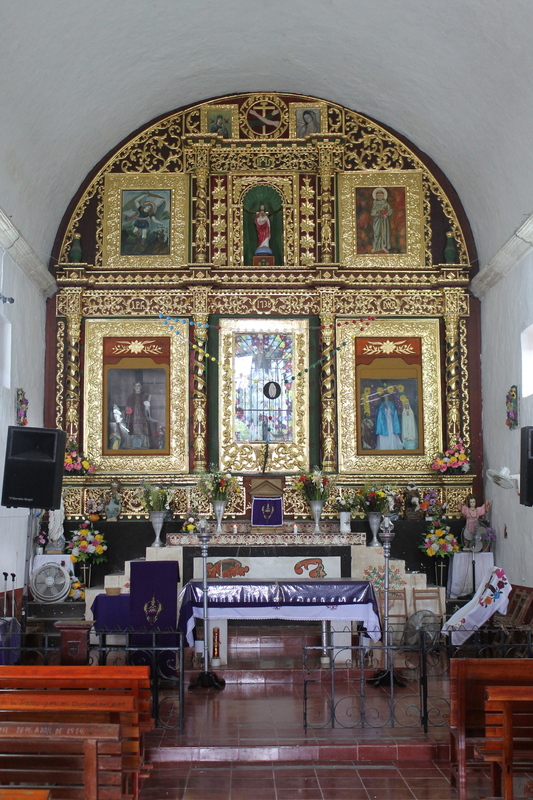 Enjoy the photos of Mama's church, one of the larger churches of the day, so far. By the way, if you are on this tour, you might be feeling the urge to visit a bathroom at this point - feel free to use the bathroom at the municipal hall across the street. Just at the entrance to Chumayel is a very colorful and photogenic cemetery that's worth a stop. So stop we did. Tekit was the next stop on the day's tour, making it church number 4, and miraculously none of the churches were closed up to this point! 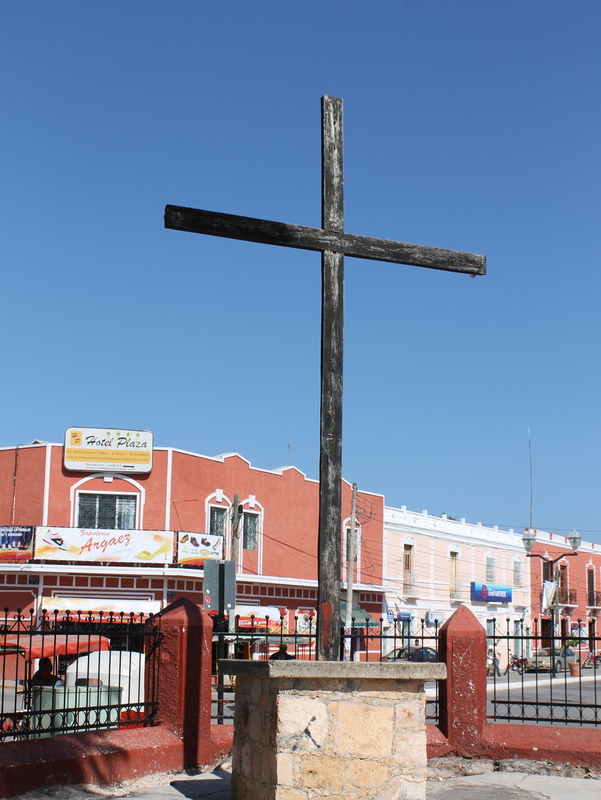 Note that there are a lot of towns in the Yucatan that begin with the prefix "Te" (Tekit, Tekik, Tecoh, Tekax, Temozon, etc. etc.) and that is because the word "te" means something along the lines of "place of". Temozon, for example is Te = place of and Mozon = whirlwind. Anyway. Back to Tekit (no idea what a kit is). The church itself is fine, a little run down compared to the others. The town looks like it has some money, but it is pretty sad looking. The mangy and hairless dog in the main square, standing dejectedly and in obvious pain waiting for some kind of relief, the dusty streets, graffiti next to the Jesus statue in the church; everything looks run down. Compared with a place like nearby Tecoh, where the residents seem to have some pride in their town and it shows, Tekit looks like no one cares. Now the sun was shining in earnest and so we stopped for lunch at the Nah Luum hotel and restaurant, just across the street from the Tecoh exit off the highway and I was pleasantly surprised to find not only an attractive little restaurant and hotel, but smiling, gracious servers and good food! Then, a small backtrack to a refreshing cenote on the way before returning to Merida - tired but satisfied with the day's achievements. Uxmal, again. It never disappoints! Uxmal is probably the most popular destination for day trips from Merida, for cruisers and non-cruisers alike. The great thing about Uxmal is that besides being the best Mayan ruins site on the peninsula in my opinion, the road to and from Uxmal offers so many interesting places to stop for a photograph, a banana or some exploration. First stop is usually the town of Uman, and on this day, that is exactly what we did. 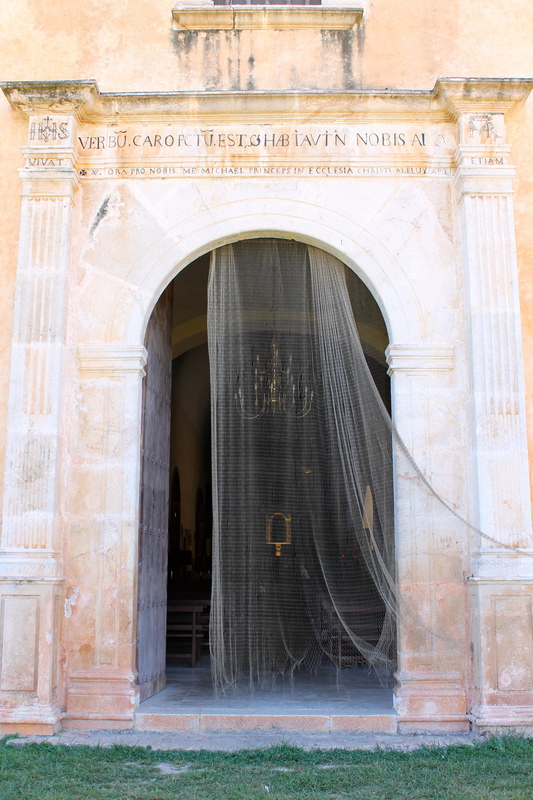 There was a small mass happening in the enormous church so we didn't go in, and later a large Mercedes hearse pulled up with Jalisco license plates for some kind of funeral. After stolling around Uman, having that banana in the market (you haven't tried a banana until you have tried a platanito dominicano) and taking a ride on the tricycle taxi, the next stop this day was Muna, where we visited Pedro (aka the Gourd Man) on his hilltop vantage point with the great view of the surrounding area. A little shopping, a sip of fresh squeezed orange juice and we are on our way to Uxmal. After Uxmal it was off-roading time and we rushed to get to the cenote in the middle of the jungle where thankfully no one else was around and no oncoming traffic on the tiny one way dirt path into the underbrush. You see, when you are in the middle of this tiny road and you see an oncoming vehicle, someone has to back up the entire distance traveled so it can be a bit hair raising. Feeling refreshed and just a little peckish, we crossed the highway and made a quick stop at the Hacienda Ochil for a bite and found them ready to close for the day, but a little cajoling (and the fact that I have been here numerous times and the waiters took pity on us) enabled us to wrangle a couple of cervezas and some delicious sopa de lima which really hit the spot. Also, we were able to see that they really do make the cochinita pibil in a fire pit and don't cheat by sticking the pig in an oven. While I love the 3 cenotes of Chunkanan (aka the Cuzama cenotes) and they are indeed magical, potential visitors should know that this attraction is in the midst of some serious problems that will come as a rather unpleasant surprise unless you read this update. Initially started as an attraction based in the village of Chunkanan, the folks from nearby and larger Cuzama realized that many tourists passed their town without stopping and decided they wanted a piece of the pie as they alleged that one of the cenotes was on their land. They therefore created their own access to the cenotes, building a rail track that intersected with the original tracks from Chunkanan. This caused some conflict, but after a few fisticuffs and much negotiation, an uneasy truce was arrived at. At the Cuzama entry point, red-flag waving men attempt to make tourists stop, telling them that the other entry point is "closed". Just beyond them are green-flag waving people from Chunkanan waving to continue on to their village and take the tour from there. Now it seems that the even larger village of Acanceh, the one before Cuzama (are you still with me here?) has gotten into the act, alleging that one of the cenotes is actually on their land and, since Cuzama was collecting a "fee" from the Chunkanan folks, has asked the Cuzama people to hand over a portion of that "fee". Cuzama has so far claimed that this is not correct and they will hand over no funds to Acanceh. Acanceh has retaliated by not allowing access to "their" cenote. Therefore, there is no access at the time of this writing to the last - and most spectacular - cenote, the one with the vertical ladder down a small tunnel-like hole. According to the folks from Cuzama, when asked, the cenote is having some "maintenance" done. Not true, according to a Chunkanan rail cart driver I talked to who then went on to explain the whole thing. A last report from a tour guide in the field one week ago, states that the Chunkanan folks are now offering only ONE cenote - the first one, Chelentun - while the Cuzama folks are taking their tourists to "their cenote" which is the middle one for those who have been before. So if you are planning to visit Cuzama/Chunkanan for the "three" cenotes, be aware that you may not visit all three, or even two, of those magnificent cenotes until someone steps in and mediates a solution that will bring the tour back in a manner fair to all parties involved. Mayan ruins, flamingos AND cenotes in one day! Often I am asked if I can arrange a tour to the three cenotes of Chunkanan/Cuzama, and while the cenotes are still there, the fantastic little tour is not. You can read about that original tour by clicking here. Short-sighted squabbling by villagers with no long-term vision of the benefits that this attraction was bringing to their communities, combined with a complete lack of any intervention by any competent authority has led to the demise of the tour, although it is still being advertised and promoted in many magazines, websites and brochures. At no point was the final user - the visitor - taken into account. He or she has to find out about this through websites like TripAdvisor or by actually arriving at the site only to find that some of the cenotes are having "maintenance" done and the tour is completely different from what is advertised. I could go on about this for hours, but don't want to bore you completely to death. Luckily, there are hundred if not thousands of cenotes in the Yucatan, of every imaginable shape and size; open to the sky, hidden in caves with just a tree root to scamper down from the jungle surface into the refreshing water below. Homun is in the heart of cenote country and right next to the the aforementioned villages of Chunkanan and Cuzama, and have their own cenote attractions - and this past weekend I took some visitors out to see a few of them. Picking them up at the beach where they were staying, they mentioned they wanted to see flamingos so we took the Xcambo - Baca - Merida road and were able to see quite a few, in small clusters, just beside the highway. Their coloring was pink with white still visible, indicating these were juvenile flamingos as their feathers don't turn completely pink until they become adults. 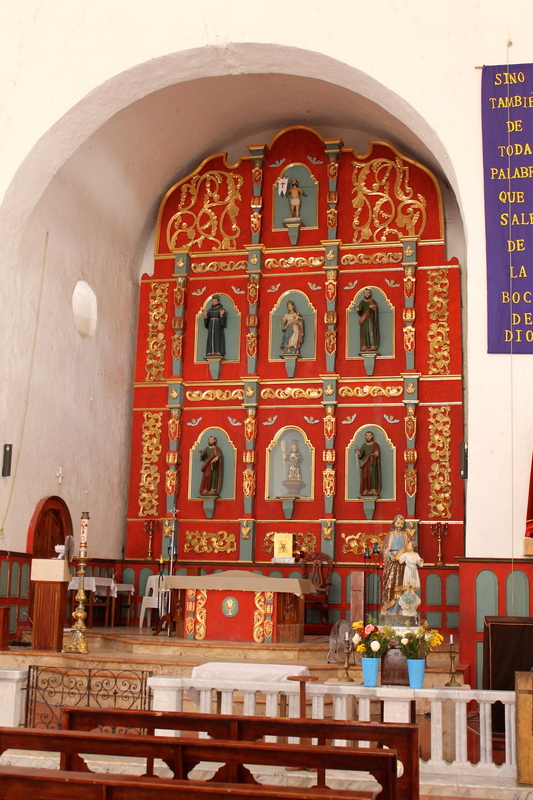 After stopping at the Xcambo ruins for photos and a quick walk through (free admission) and some flamingo photos, we continued on through Baca and visited its large church in the middle of town. Baca was an important city back in the day and while it is somewhat deteriorated since the henequen industry crashed, you can still see evidence of it's relative wealth in the colonial era and turn of the century buildings along the main street. After Baca, a straight shot out to Homun, where we hired a local guide - a 12 year old who swore she was 16 named Barbie - who rode with us to all the cenotes and made the introductions at each one. It is not necessary to hire someone local to visit the cenotes if you know where they are, but why not spread the wealth and help folks in Homun out a little? For $200 pesos you have a chatty local guide who knows everything about everyone in the town (just ask) and you are helping an entire family. Barbie has been doing this since she was 8 years old, and while for us North Americans it is a bit disconcerting to think that you are sending your 8 year old daughter to ride around with strangers to caves, it seems to not raise an eyebrow here. I think if an evil-doer ever tried anything, the villagers would see to it that he had a particularly nasty end. 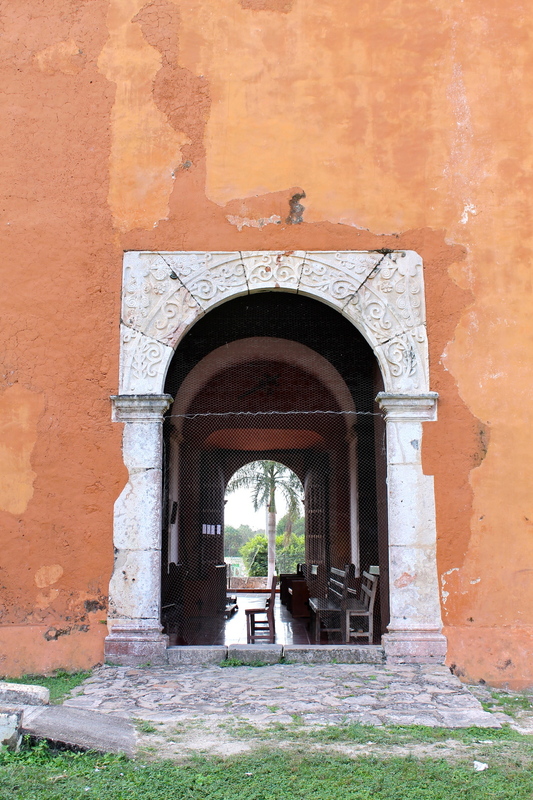 Susan and her husband were back in town with their parents and they wanted to see one of the Yucatan's many haciendas. The original idea was to go to Sotuta de Peon but since the House and Garden tour they were on finished too late to make that happen, I thought it better that we visit the Yaxcopoil hacienda. With the tour behind us, we drove to the nearby hacienda Yaxcopoil, but of course, as always happens on one of our tours, there was a diversion. A detour, a small stop, a side road; these are the things that make the trip memorable and today was no exception. Everyone was hungry and wanted to eat before visiting the hacienda where Doña Nica most likely was no longer making panuchos under the tree on her makeshift griddle over a fire, and so a quick ride around the block in Uman yielded the La Margarita restaurant, on the main square, serving home cooked meals. The menu? Bistek con papas and espelon con puerco, a version of frijol con puerco (pork and beans) that is very special as the espelon is the tender, new version of the black bean and gives the dish a particularly delicious consistency. Energy restored, we continued on to Yaxcopoil and enjoyed this immensely photogenic hacienda in the warm glow of afternoon light, before returning to Merida for a well deserved nap. With no one at home and a free afternoon, I decided to take an exploratory trip to the Oxkintok ruins which I had previously only caught a glimpse of on my way to some secret caves in the area with local guide Victor. 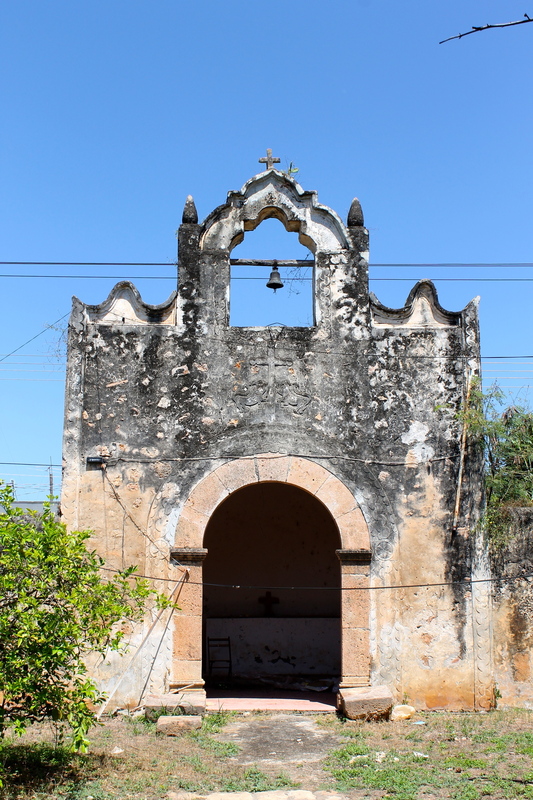 However, on the road to Maxcanu where I would be turning off towards Oxkintok I saw signs for the Santa Rosa hacienda, one of the Starwood properties here in the Yucatan and decided that I would like to check it out instead and pehaps hit the ruins afterwards. What I found was an absolutely gorgeous property, not unusual for the Starwood hotels, along with really friendly and welcoming service and perfect afternoon light for some photographs. The lunch, served for the only visitor in the hacienda - yours truly - was delicious and served in a professional and courteous manner that the Temozon hacienda can only dream of. With a delicious lunch in me, I continued on to Oxkintok, via Maxcanu and a curious town called Granada, a name I had never heard of in the Yucatan so of course I had to check it out. Not much there, except another grand hacienda, unrestored and full of villagers watching a baseball game in what used to be the main corral of the building. The road from Santa Rosa to Maxcanu. Granada? Really? 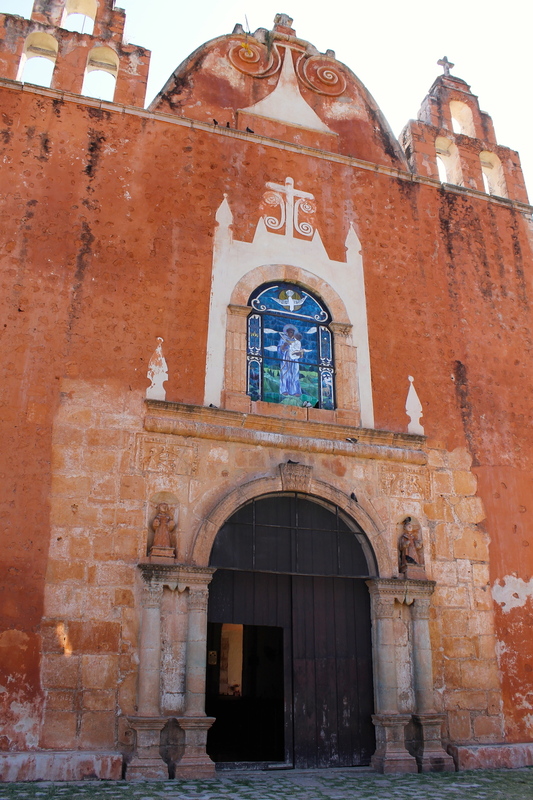 The bright blue church (facade) in Granada, Yucatan. A quick drive through Maxcanu where the Sunday afternoon drinking activity was fully in session with groups of drunken men on many street corners. Maxcanu deserves a more detailed photographic study, but the clouds were moving in and I had precious little time to get to the ruins before a) they closed and b) the rain started, so I quickly continued on to Oxkintok. The drive to Oxkintok from Maxcanu takes about 10 minutes if you take the old highway that goes right through the ruins. It is a pot-holed, unpaved mess in most parts and will take out a tire if you are not careful, and those holes are hard to see with all the rain. I arrived at the ruins in time to spend about 20 minutes before they closed, and after 5 minutes, the skies opened up and a torrential downpour had me soaked to the skin in just a few seconds. The photos are not great but you can get an idea of what is there - which is probably bigger than some of the other, more popular sites around such as Chichen and Uxmal. The place is HUGE. Why is this city yellow? It depends on whom you ask. One theory says it was always yellow, while another and in my opinion more believable theory states that it was painted Vatican yellow in honor of Pope John Paul's visit here. That's right, the Pope came here and if the Pope can get all the way over here from his comfy palace in the Vatican, so can you. 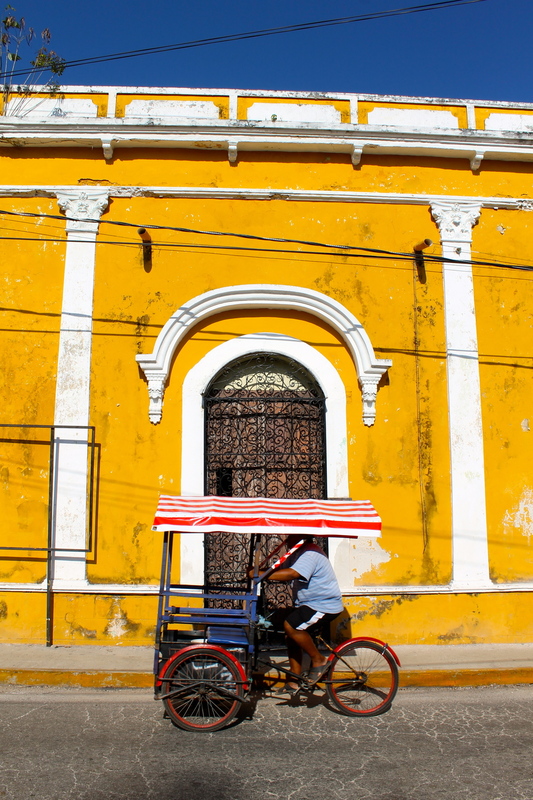 Izamal is about an hour and a bit outside of Merida, towards Cancun on highway 180. There isn't a lot to do on the way, unless you count the town of Kimbilá, which is known for its textiles although a recent visit left me feeling a little Shania about the whole place: So you have hipiles? That don't impress me much. In Izamal itself, you should visit the monastery, which has as its front yard the second largest atrium (after the Vatican) in the WORLD. That's right. And the whole structure is on the base of a Mayan pyramid that once stood here and whose stones were used for the construction of this and other buildings around town. There is still the Kinich Kakmo pyramid just across the way, a few blocks walk actually and very near the Kinich restaurant which serves up splendid Yucatecan fare and is a must-visit when in town. Other interesting places in Izamal are the combination embroidery shop/herbal medicine place (you will have to ask) as well as plenty of handicrafts and artisans goods at several galleries and boutiques. One thing to keep in mind is that if you should visit the shirtless man in charge of the herbal remedies for everything from cancer to impotence to AIDS and want to engage him in a conversation, make some time available as he will go on for hours.